Provide comfort for the family of Francis "Frank" Bisson with a meaningful gesture of sympathy. It is with great sorrow that we announce the passing of Francis “Frank” William Bisson, at Pinecrest Manor in Lucknow, on Monday, January 21st, 2019 at the age of 87. Frank was predeceased by his beloved wife, Mary Jane (nee Kilpatrick) in 2002, one brother, John and one daughter-in-law, Heather (Ken). Loving father of his four sons, KC “Ken” of Orleans, Robert (Kim) of Kincardine, Jeffery (Janet) of Hamilton and James (Kathy) of Mississauga. Frank was also grandfather of Kieran, Jessica (Simon), Sam, Calvin, Christopher and Kassandra; and great grandfather of Weston. He will be missed by one brother, Jim (Jeannine) as well as many nieces and nephews. 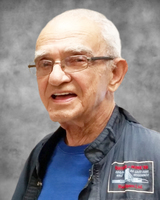 Before he moved to Kincardine area in 2017 to be closer to family, Frank was a long time resident of Elliot Lake, working as a projectionist, property manager and, finally an electrician at Rio Algom. He will be remembered by his friends and family for his sense of humour and willingness to always lend a hand. According to Frank’s wishes he has been cremated. A service for family and friends will be held in Elliot Lake at a later date. Memorial donations to the Heart and Stroke Foundation or St. Joseph’s General Hospital would be appreciated as expressions of sympathy by the family and can be made through the funeral home (519-396-2701). To send flowers in memory of Francis "Frank" William Bisson, please visit our Heartfelt Sympathies Store. We encourage you to share your most beloved memories of Francis "Frank" here, so that the family and other loved ones can always see it. You can upload cherished photographs, or share your favorite stories, and can even comment on those shared by others. Provide comfort for the family of Francis "Frank" William Bisson by sending flowers. To Rob, Kim and family, our condolences on the passing of Frank. Dave and Louise.